ST. LOUIS, Missouri, February 29, 2012 (ENS) – Storms and tornadoes slammed through Illinois, Kansas, Kentucky, Missouri and Nebraska overnight, claiming at least 12 lives in three states. Tornado watches and warnings continued today for portions of the Central Plains and the Mississippi, Ohio and Tennessee Valleys. Residents are advised to be on the watch for tornado warning signs such as dark, greenish clouds, large hail, a roaring noise, a cloud of debris or funnel clouds. Harrisburg, Illinois is under a dusk-to-dawn curfew tonight after a severe tornado hit the city at 4:56 am Wednesday. The twister plowed through the city of 10,000, where authorities say six people were killed. 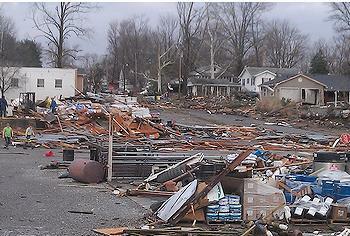 At least 200 homes were hit in a trail of destruction about a mile and a half wide across Harrisburg, in Saline County. Two dozen businesses were damaged or destroyed, many of them located in a strip mall struck by the storm. The wind blew the walls off some rooms at the Harrisburg Medical Center, but courageous staff were able to move the most seriously ill patients out of harm’s way. In the country music destination of Branson, Missouri, people were trapped in their homes and buildings in the city’s famous theater district were heavily damaged just before the opening of the tourist season. The storm destroyed a mobile home park and left at least one person dead in Buffalo, Missouri. Dozens more were injured, buildings destroyed and thousands stranded without power. This is the third time tornadoes have devastated parts of Missouri in less than a year. In Kansas, Governor Sam Brownback declared a State of Emergency on Tuesday for the affected areas southwest of Topeka. 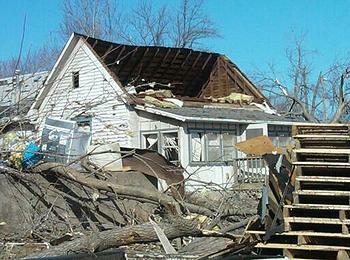 A tornado touchdown in Harveyville, Kansas, population 250, damaged homes and infrastructure. One person died, and 10 others were injured, one critically. The Kansas State Emergency Operation Center is partially activated and Kansas Task Force-2 was deployed to assist in search and rescue operations. The American Red Cross has established a shelter at Harveyville High School. “The state’s emergency management team is working with local leaders to address their citizens’ immediate needs and to organize the cleanup of the storm debris,” the governor said. The governor will tour Harveyville Thursday afternoon with Kansas Adjutant General Maj. Gen. Lee Tafanelli, then meet with city leaders and residents about the recovery and rebuilding of their community. FEMA Region VII remains at Watch/Steady State. There are no requests for FEMA assistance. The Red Cross warns that people should use flashlights, not candles, when examining buildings. If someone smells gas or hears a hissing noise, they should open a window and get everyone out of the building immediately and call the gas company or fire department. Check for injuries, the Red Cross advises. If someone is trained, they should provide first aid until emergency responders arrive. People should listen to their local news or NOAA Weather Radio for updated information and instructions.